4 Crafty Chicks Challenge - Chicks Rule! - Gotcha covered!!! I just flew (pun intended) by the seat of my britches on this one. I just took a piece of 12x12 cs and cut it down to 11 x 4. Then I scored at 1 3/4", 5 `/2", 6 5/16" and 7 3/16". It makes the cutest little purse/treat holder. What a cute little bag. Thanks for joining in the fun at our Chicks Rule challenge. Cute purse!! Thanks for joining us at 4 Crafty Chicks this week! 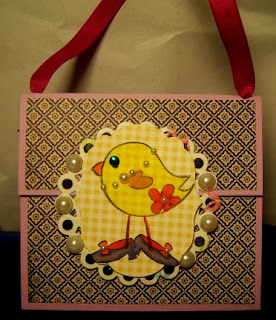 Cute card, thanks for joining us at 4 Crafty Chicks this week...nicely done! super cute creation and I love your pun...hee hee. The image is adorable and the pearls highlight it perfectly. Thanks so much for sharing your beautiful creation with us. Wonderful treat bag.